Reddit user [eyelandarts] has produced a rather unique 3D printing project. A 3D printed Zoetrope. You see, a zoetrope was a device that created an animation effect that pre-dates film technology. It would create the illusion of motion much like a flip book does, but with a spinning cylindrical wall with slots cut into it. As the cylinder spins, you catch a glimpse of the animation through the slots. But, it’s just a 2-dimensional animation — what if you replaced it with an ever changing 3D model? It’s actually been done before. A long time ago in fact. In 1887, [Etienne-Jules Marey] created a large zoetrope to animate plaster models of a bird in flight. Fast forward to today, and [eyelandarts] has 3D printed something similar — but ditched the cylindrical wall. Instead, a strobe light is used to see the animation! The end result is quite awesome if we do say so our-selves. For another fun take on Zoetropes — how about a digital one made out of tiny LCD screens? Siezure-warning… there’s a very flash-tastic demo gif embedded after the break if you’re brave enough to view such a thing. Texas Instruments’ MSP430 series of microcontrollers has been the standard extremely low power microcontroller for several years now. It’s not an ARM, though, so while there are fans of the ‘430, there aren’t a lot of people who would want to port their work in ARM to a completely different architecture. Here is TI’s answer to that. It’s called the MSP432, and it combines the low power tech of the ‘430 with a 32-bit ARM Cortex M4F running at 48MHz. This is not the first ARM Cortex M4F platform TI has developed; the Tiva C series is based on the Cortex M4F core and was released a few years ago. The MSP432 is a little bit different, leveraging the entire development system of the MSP430 and adding a DSP engine and a FPU. If you’re looking for something that’s low power but still powerful, there you go. You can find the official press release here. If you’d like to try out the MSP432, there’s a LaunchPad available. $13 to TI gets you in the door. The most capable MSP432 with 256 kB of Flash, 64 kB of SRAM, and 24 ADC channels hasn’t hit distributors yet, but you can sample it here. While totally useful, this simple filter is a bit boring and difficult to make dynamic. So we’ll look into an entirely different filter, the Twin-T notch filter, that turns out to be sharp enough to build a sine-wave oscillator on, and tweakable enough that we’ll make a damped-oscillator drum sound out of it. Here’s a quick demo of where we’re heading. Read on to see how we get there. 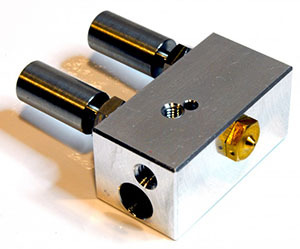 Let’s talk about the newest part of this year’s Hackaday Prize: Best Product. In addition to all of the other prizes offered, the Best Product Prize will award $100,000 to one entry which is designed for manufacturing and embodies the core of this year’s theme. What exactly does that mean? It boils down to one hundred grand to jumpstart your product launch. Let’s take a closer look at why we added this prize and the specifics of entry. You have a working prototype and you’re one step away from making your first million, right? That is almost always a fallacy. One major hurdle is the engineering needed to take a working prototype to the factory line — that can be nine-tenths of the work. Designing for production is a story that we want to tell. This becomes an educational tool for those just starting to learn about product design. If we make the steps, gotchas, and tricks of the trade easier to learn we chip away at the hard part of hardware and this is one of the chief motivators for adding Best Product. Before you take the risk you want to make sure there is a customer base out there who want to buy your hardware. We’ve noticed that Crowd Funding platforms are a growing avenue for market research. It has become something of a pre-order system, but it also means that all decisions are somewhat locked in before going into production. We see the Best Product prize as a way to prove the market, not just for the winner but surely for all of the ten finalists as well. Still want to go the crowd funding route afterwards? Fine, we’ve seen big things happen for a lot of great builds featured on Hackaday. But competing for the Best Product award keeps your options open during and after the crowd has spoken their peace. The entry requirements and judging criteria for Best Product are both a bit different form the main entry field. Rest assured you are still eligible to compete for all of the other prizes. On the entry side of things the biggest difference is that you need to send us three working beta units for testing by August 17th. 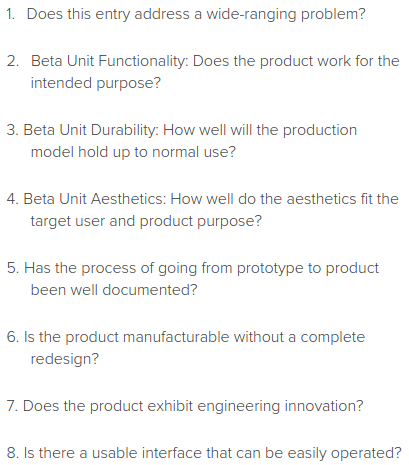 When we sat down to figure out what makes something “a product”, the existence of several working prototypes in the hands of beta users was high on that list. In this case we’ll be the testers but this lets us verify that entries aren’t vaporware. You will also need to complete most of your documentation by the entry date. On the judging side of things the criteria quite different. One noteworthy change to point out; Openness is not among the Best Product judging criteria. If you want to keep the secret-sauce secret you won’t be penalized for it. However, if you also want to win the Grand Prize, Open is the way. Now that you’re really excited about all of this, make sure you go and read all of the Official Rules. Sections 4 & 5 both have information about Best Product entry and judging criteria. Getting your entry started is easy. Just begin a project on Hackaday.io and add the tags “2015HackadayPrize” and “BestProduct”. This lets us know you’re in it to win it and we’ll keep you informed of what is coming down the pipeline as the Hackaday Prize progresses.